Blood, which requires extraction through pheresis, wherein blood is drawn from the donor (similar to a blood donation), passed through a machine that extracts the stem cells and returns other portions of the blood to the donor. 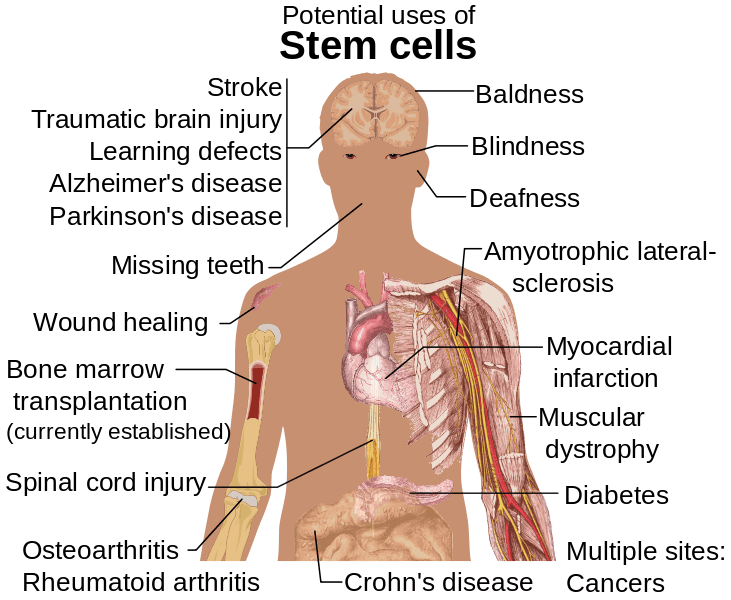 Diseases and conditions where stem cell treatment is promising or emerging. Bone marrow transplantation is, as of 2009, the only established use of stem cells. Medical researchers believe that stem cell therapy has the potential to dramatically change the treatment of human disease. A number of adult stem cell therapies already exist, particularly bone marrow transplants that are used to treat leukemia. In the future, medical researchers anticipate being able to use technologies derived from stem cell research to treat a wider variety of diseases including cancer, Parkinson’s disease, spinal cord injuries, Amyotrophic lateral sclerosis, multiple sclerosis, and muscle damage, amongst a number of other impairments and conditions. However, there still exists a great deal of social and scientific uncertainty surrounding stem cell research, which could possibly be overcome through public debate and future research, and further education of the public. One concern of treatment is the risk that transplanted stem cells could form tumors and become cancerous if cell division continues uncontrollably. Stem cells are widely studied, for their potential therapeutic use and for their inherent interest. Supporters of embryonic stem cell research argue that such research should be pursued because the resultant treatments could have significant medical potential. It has been proposed that surplus embryos created for in vitro fertilization could be donated with consent and used for the research. The recent development of iPS cells has been called a bypass of the legal controversy. Laws limiting the destruction of human embryos have been credited for being the reason for development of iPS cells, but it is still not completely clear whether hiPS cells are equivalent to hES cells. Recent work demonstrates hotspots of aberrant epigenomic reprogramming in hiPS cells (Lister, R., et al., 2011). 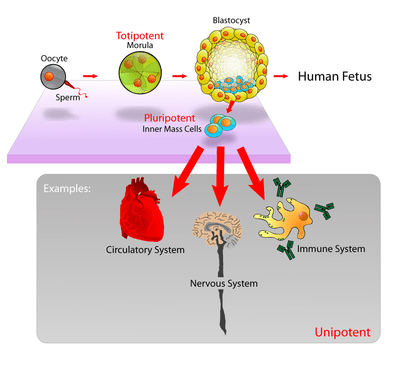 The stem cell research division of the Tisch MS Research Center of New York announced that the U.S. Food and Drug Administration (FDA) approved autologous, mesenchymal stem cell-derived neural progenitor cells (MSC-NPs) as an Investigational New Drug (IND) for an open label, phase 1 clinical trial in the treatment of multiple sclerosis.